Things That You Can’t Help But Think About | "Northern Crossings"
Several “victims” of sexual abuse speaking the other day about the fact that it is something that is impossible not to remember were attacked by some others who said that the way many deal with it is by represssing the memory. So either this is something that is so pernicious precisely because you can’t forget it or it is not. Even in a world where sexual identity and the politics that go along with it are seeming to trump all else, we can’t even agree on the nature of sexual harrassment, assault or abuse. There is a Biblical adage that was and is important. The Bible is plain that any statement with important content must be atttested to by “two or threee witnesses” . We are to be witnesses to Christ and his love and our testimony is backed up by the Holy Spirit. The trial and crucifixion of Jesus was a travesty because the witnesses “contradicted one another”. It is easy to get people riled up with anger and spite over false witnesses and innuendo. The point of God’s Law and Civil Law is to bring some kind of sanity to questions that arise and how they can be answered. Witnesses are indispensable and the gravity of the charges do not overcome the evidence and that testimony of witnesses. When simple accusations are allowed to reign without evidence or witnesses we have something like what happened in Ephesus when false accusations brought a riot about. 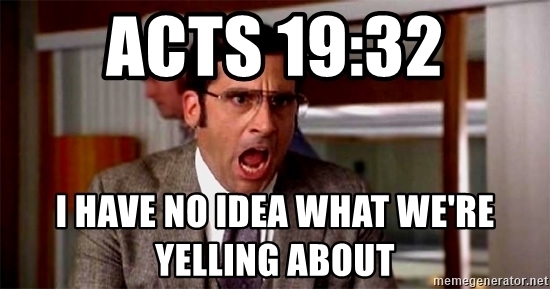 Acts 19 tells what happened. Accusations were made and a mob was incited and actions were being taken in the confusion. Finally an appeal to the Law is made and things are worked out but in the meantime – “Some therefore cried one thing and some another, for the assembly was confused, and most of them did not know why they had come together”. Sounds like what we watch on the news daily. NextCommon Worship of a Delightful God. Jesus Mission From the Cross. Klemet Preus prompts a thought.